I’m writing from my new home in Ås, Norway, and there’s so much I want to share with you! But first, I have to get through some stops in Germany. My second day in Munich was also wonderful, and made me understand why people say that it is such a livable city (good restaurants and cafes and protected bike lanes and shaded parks and fast public transportation! Really all I want out of a city.) I spent the morning at another fantastic coffee shop closer to my apartment, Gangundäbe, which was serene and charming. From there, I walked to Man Versus Machine for my second cup, and even though I was planning to get another transcendent banana bread, I instead saw a new croissant-looking thing that wasn't there the previous day, my sixth pastry sense strongly pulling me towards it. In a typical scenario, I was getting all worked up about some delicious food, and had no one to share it with, so instead I gushed to the slightly startled owners about how incredible it is, and I learned that it's called a "Leckere Franzbrötchen mit zimt and marzipan" (translates to “Leckere Franzbrötchen with cinnamon and marzipan”). It's a pastry from the north of Germany, and there aren't a lot of places to find it in the south, but, one of the owners at Man Versus Machine (the burly bearded one) is from the north and really wanted to sell it. I'm glad they do! Wonderfully satisfied from my pastry and coffee, I walked through a church cemetery, Südlicher Friedhof, which I had spotted the previous day. It was quite large, several city blocks, enclosed by tall brick walls and full of old gravestones nestled among large, leafy trees. I liked how wild and overgrown it was, with vines and shrubs growing up and over the gravestones; it felt almost abandoned, like the earth was trying to take it back. It wasn't mentioned in any of the Munich websites I'd seen, and I don't know why, it's a nice place to stroll through, or sit down on one of the benches and read a book, as I saw a few people doing. In the early afternoon I met up with Laurin again, and we did an abbreviated tour of the typical touristy sites, walking through Marienplatz and Odeonplatz. I always like to see the fancy churches and cathedrals, and so we popped into the Asamkirche, which is small but so densely decorated that it seems like the designer had a whole cathedral's-worth of ideas but only a small church to work with, but he was determined to get them all in anyway. We went into the Theatinerkirche St. Kajetan, whose entrance I probably would have missed on my own as it's behind scaffolding, but I'm glad Laurin knew about it. It had been largely damaged during WWII, but then reconstructed. However, they didn't paint any of the inside, so everything, from floor walls to ceiling, is a cool white, and I loved this, it felt a bit like visiting the airy, wispy, cloudlike heaven from every cartoon ever. I don't have any proper photos, unfortunately, but I suggest you scan Google images to get an idea. For lunch, we went to Viktuelienmarkt, which is a permanent food market right near Marienplatz, with a beer garden in the center where you can bring your own food as long as you buy beer. It was incredible! Eventually I was able to somewhat compose myself after being floored at how many different kinds of sausages there were. I indicated to Laurin that I might need a small snack in order to make level-headed decisions about what to get for lunch, and so he got me a Leberkäse, which translates literally to "liver cheese" even though it contains neither of those things. This one was made of horse meat, actually, which I had never eaten before, and was like a highly emulsified meatloaf served on an undersized bun. I scarfed it down, and then we took a more leisurely trip around the market getting bread, cheese, and olives, and then sat in the beer garden with a liter full of beer (full disclosure: I opted for half beer, half lemonade, because I wanted to remember the rest of my afternoon.) Apparently, this is just what Bavarians do—they sit around outside and drink large quantities of good beer and eat large quantities good food, often sausages, and just generally hang out. What a people. I also really appreciate that the standard beer you’ll get is a wheat beer. For years and years I have felt disrespected by beer snobs in the US because I don’t like hoppy beers, but Germany, with its Weiss beers and Hefeweizens, is my beer country soulmate. 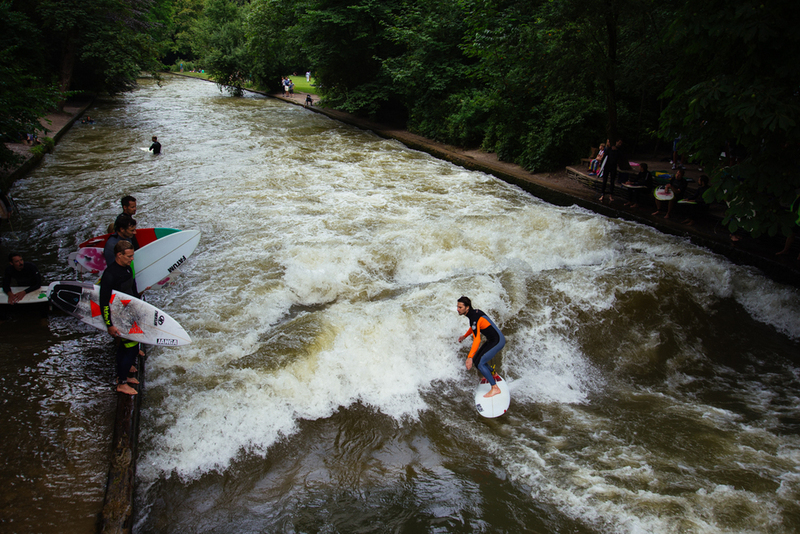 After stuffing myself to the brim at Viktualienmarkt, Laurin gently rolled me over the river surfers on the Eisbach at the Englischer Garten, which was super cool. It’s a manmade section of the river, with a manmade wave right by a bridge. Surfers line up on either side and take turns surfing for a minute or so, before letting themselves get swept away so the next person can jump in. It was mesmerizing, and I ruminated on how small decisions, such as slightly changing the contours of the bottom of a manmade river, can give rise to such a wonderful and unique cultural niche within a city. Also, at the trash bins near the river surfers there is a separate tray area on top where people can put their cans or bottles with deposits, so that anyone that wants to deposit them can easily grab them, without having to go through the indignity of rifling through trash. It was just one of many examples of nice, considerate things in Germany that made me smile, and wonder why we don’t do that sort of the stuff in the US. The Englischer Garten is huge and lovely, and I couldn’t help but be jealous at how many beautiful, shaded green spaces there were to hang out in. Germany, I think, really does parks right. And of course, it wasn’t long before we hit another beer garden, this one a bit more touristy, but still a welcome sight. We got another beer, before walking back to the center and going our separate ways. The next day, Laurin wasn’t free to hang out, so I was on my own again. This time, I was determined to not end it like my other day of free travel, so I headed it off with an aggressive schedule of charming cafes with killer cappucinos, followed by a leisurely stroll through a super fancy palace, which I find always puts me in a good mood. The Residenzemusem was the main residence of the rulers starting in the 17th century, and is absolutely massive, with gorgeously decorated rooms and halls. I didn’t take any photos, but you should check out their website to get an idea of its opulence. Not so many people were there on a Thursday, so sometimes I would find myself all alone, save for the ever-present museum attendants. I got the triple ticket so I also got to see the Cuvilliés Theatre, which is similarly resplendent, and the Treasury, where they had some pretty stunning crowns and jewelry and the like from many centuries ago, and you get to trace the fads among the royals through the ages (who could forget the Ostrich Egg years?) I would highly recommend a visit if you ever find yourself in Munich. Overall, I left with an overwhelmingly positive view of Munich and Germany in general, but it was time to move on. On Friday morning, I left Munich to meet my sister for the sister leg of the journey.